As SATA SSDs slowly give way to M.2 SSDs, so too have the SSDs' use cases. Besides internal storage, of course, SATA SSDs have also commonly been used as both temporary and permanent external storage thanks to cheap SATA-to-USB adapters. And now that M.2 drives are rising in popularity, similiar adapters are popping up for SATA drives in the new form factor. 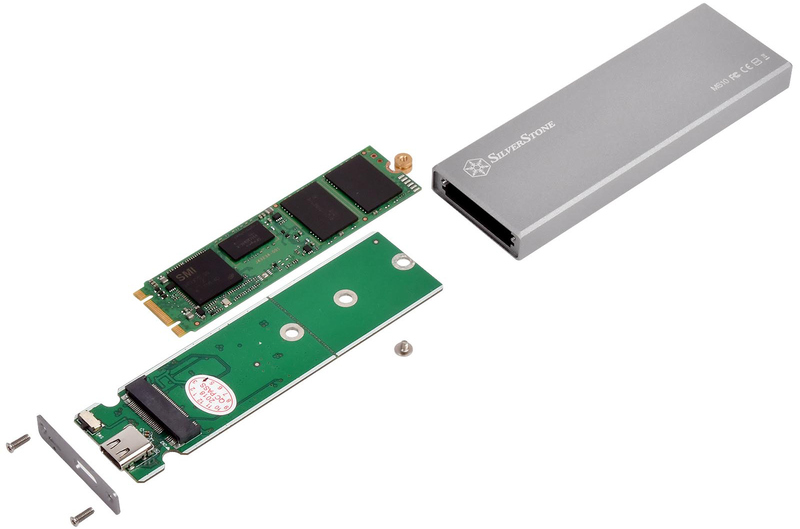 The latest of these being SilverStone's recently launched MS10, a SATA M.2 SSD adapter that supports 10 Gbps USB transfer rates. 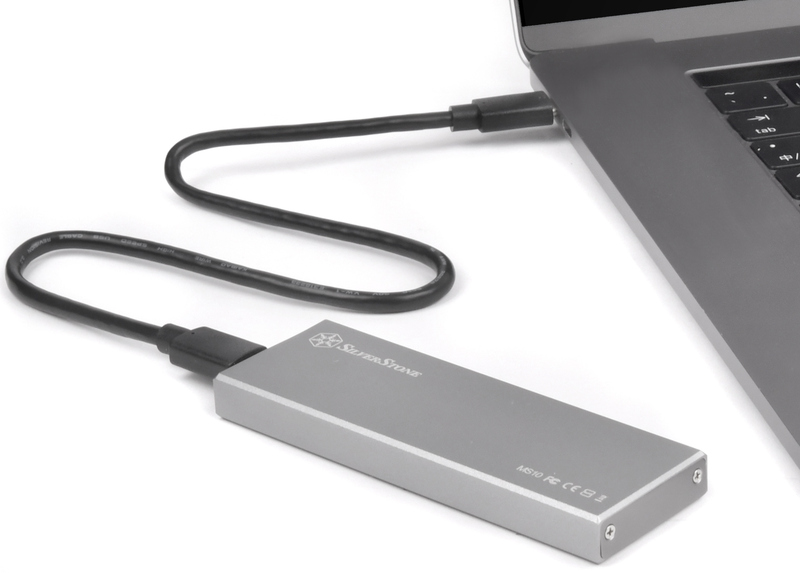 The SilverStone MS10 (SST-MS10C) is an aluminum enclosure measuring 104×35×11 mm and featuring a USB Type-C connector. The device is based on JMicron’s JMS580 USB 3.1 Gen 2 to SATA 6 Gbps bridge, with the use of USB 3.1 Gen 2 (10 Gbps) meaning that the adapter offers more than enough upstream bandwidth to saturate a SATA SSD. On which note, it goes without saying that due to the controller used here, the MS10 only supports SATA-type drives, and it will not work with PCIe-based drives (be it AHCI or NVMe). Meanwhile the chassis itself is appropriately spacious, as it accommodate one single-sided M.2-2242/2260/2280 drive. 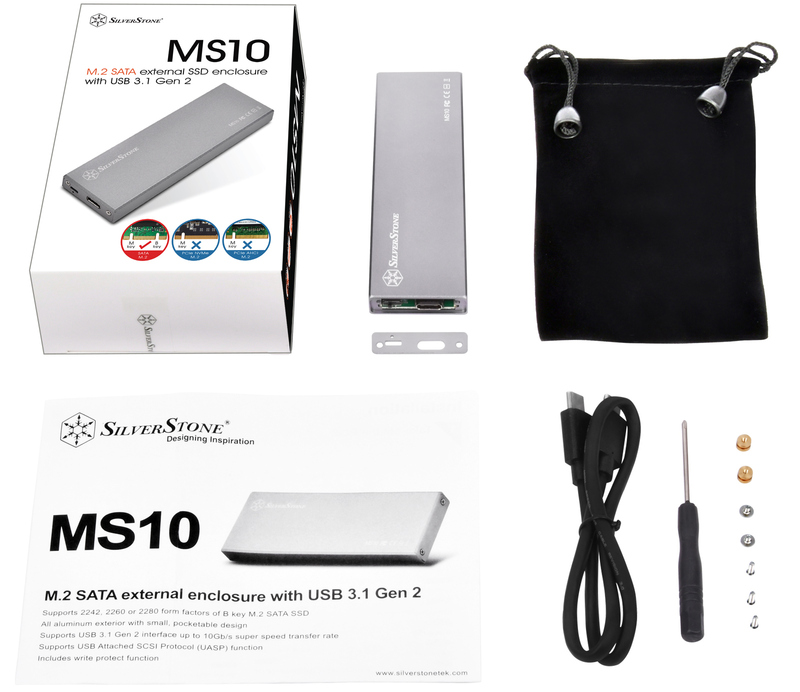 The MS10 enclosure is aimed at owners of modern laptops with USB Type-C connectors. To protect the chassis, SilverStone ships it with a protective bag. The drive also sports a write-protect switch, in case it ever needs to be hooked up in a read-only fashion to avoid disturbing the data on the drive. SilverStone’s MS10 chassis will be available in the near future. Pricing is unknown, but as a SATA-only adapter it should not be too expensive.